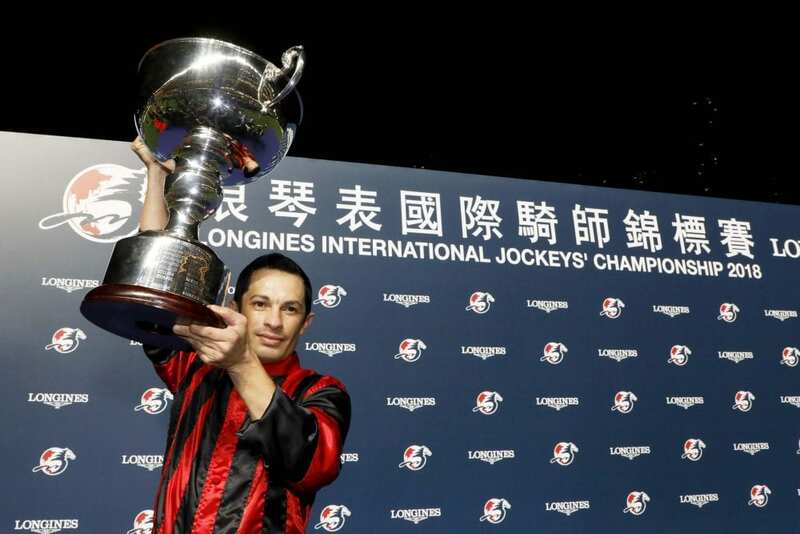 Born in Brazil, but representing Great Britain, Silvestre de Sousa scored points in all four legs of the LONGINES International Jockeys Championship at Happy Valley tonight (Wednesday, 5 December) to run out the convincing and deserved winner. But that does not do justice to the drama of the evening, with the outcome only being decided in the final leg of a thrilling night's racing. Ireland's Colin Keane got his Hong Kong debut off to a flying start in the first leg when making his first ever ride at Happy Valley a winning one on the John Size-trained Special Stars. Drawn widest of all in Gate 12, Keane broke alertly to take up a position in mid-division, tracking the leaders before launching his challenge off the home turn. Special Stars responded to his encouragement to run down the leaders in the home straight and won a shade cosily by a length and a quarter from de Sousa's mount Midnight Rattler. De Sousa struck in the second leg, with Gate 12 again proving no handicap, as he broke Jimmy Ting's Glory Star from widest of all to take a lead that he was never to surrender. US star Javier Castellano threw down a challenge on Good For You, but Glory Star had too much in reserve and held on for a convincing win. Keane picked up more points for third on Tony Millard's C P Power, so at the end of leg two de Sousa led on 18 pts, with Keane second on 16, and Castellano third on six. Vincent Ho got his name on the scoresheet in the third leg, when getting up close home on Manfred Man's Little Island, running down long time leader Curling Luxury and Castellano. De Sousa could only manage third aboard favourite All You Know, but the four points earned increased his lead over Keane to six with one leg to go. “It's great to win here, and to be in this field. He travelled well – I got a little bit squeezed – but then he gave me a good kick. I've a chance in the last and I'll be doing my best,” said the winning jockey. In the event de Sousa took the championship in emphatic style on John Moore's Experto Crede when dashing through on the rail to hold the challenge of Ryan Moore on the John Size-trained Bank On Red. Hong Kong racing returns at Sha Tin on Sunday (9 December) with the biggest day in the calendar. The LONGINES Hong Kong International Races feature four world-class G1 contests – including the HK$28 million LONGINES Hong Kong Cup – and a ten-race card begins at 12.25pm. This entry was posted in NL List, People and tagged happy valley, hong kong, Hong Kong racing, Jockeys, Jockeys Championship, silvestre de sousa by Press Release. Bookmark the permalink.